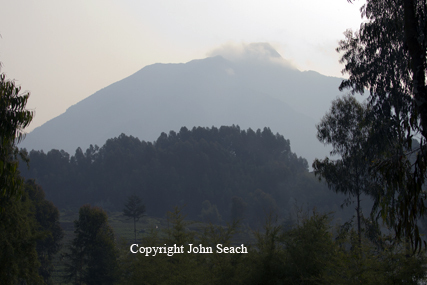 Muhavura volcano is located at NE end of the Virunga Range on the Uganda/ Rwanda border. Muhabura lies in Volcanoes National Park, Rwanda and Mgahinga Gorilla National Park, Uganda. Muhavura presents different profiles when viewed from different sides. The most impressive views are from the north and north-east. The base of the volcano measures six miles in diameter. Gahinga (Mgahinga) volcano is joined to Muhavura on the west by a broad saddle. There is a crater lake on Mt Muhabura. The plains at the foot of the volcano are characterised by deep volcanic ash, and run-off from the mountains rapidly disappears underground. The main source of the north-flowing surface water is the Kabiranyuma swamp in the Muhabura - Gahinga saddle. River Kabiranyuma drains the swamp and is an important source of water for the populations around. It is the only river that does not dry up completely in the driest months of June to August. Muhavura, has a very youthful morphology and appears to be intermediate in age between the currently active volcanoes of the Virunga range and the more deeply eroded Sabinyo.